The St. Lawrence Seaway, a system of locks, canals and channels, started the decline of mass grain and commodity storage in Buffalo. Opened in 1959, it allowed ocean-going vessels to travel from the Atlantic Ocean to the Great Lakes of North America bypassing Buffalo entirely. Prior to the completion of the Seaway, goods heading westbound to Chicago, Detroit and other Midwest markets traveled first to Buffalo via the Erie Canal or by rail before being loaded onto ships for passage via Lake Erie. Grain by the boatload made the return trip, to be stored in storage elevators, ground into flour and other finer materials, and hauled to the Atlantic Seaboard either by canalboat or train. By the close of the 19th century, Buffalo had become the largest lake port and grain-milling center in the United States, and the second-busiest railroad hub after Chicago. There were more than 50 grain storage units that lined the inner and outer harbors, Lake Erie and the Buffalo River. 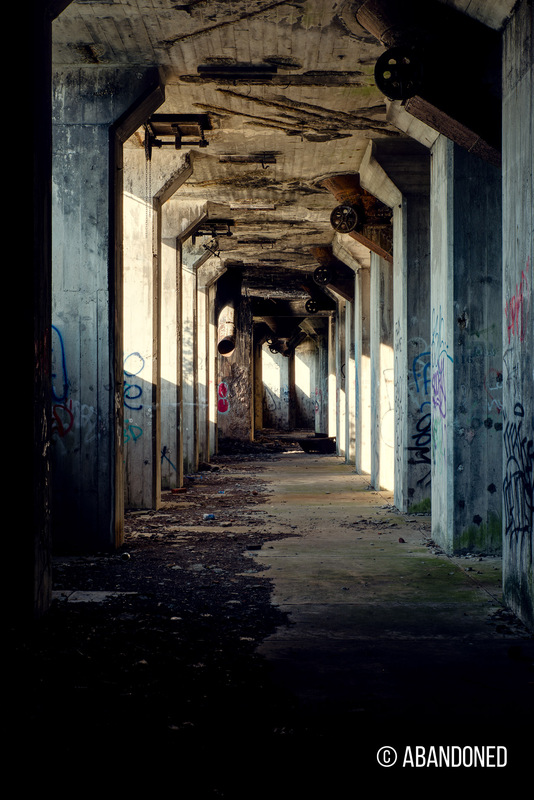 Those were steadily replaced by reinforced concrete elevators with far larger capacities. 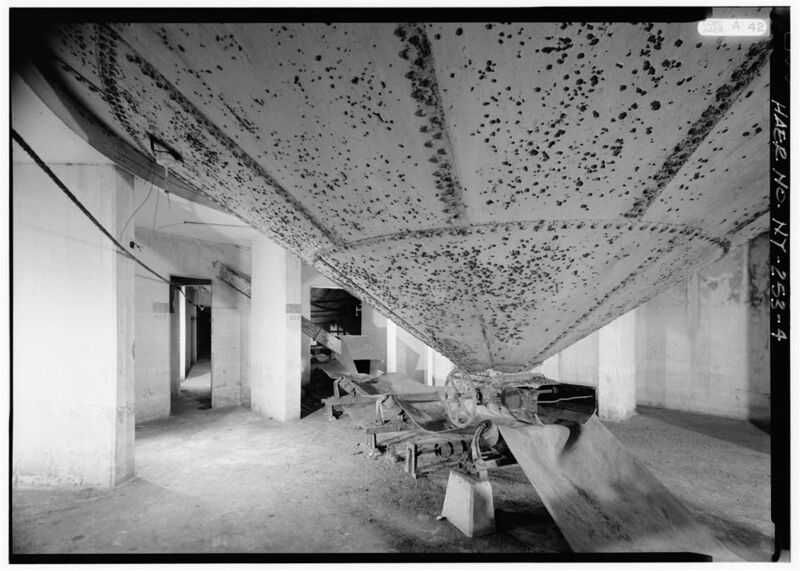 By 1931, Buffalo had 38 elevators with a total capacity for 47 million bushels of grain. Buffalo, then the largest inland port in America, was predicted to become one of the world’s largest ports, open to ships from every continent. Demographers saw the Buffalo metropolitan area, which stood at 1.2 million in the mid-1950’s, explode to 2 million or 3 million by the 21st century. The city was anticipating immediate success from the Seaway, much like what occurred after the Erie Canal opened in 1825. A city directory from 1836 bragged about the Erie’s importance to Buffalo, as much of America’s trade flowed through the city. Railroads had made the Erie obsolete to grain shippers heading eastward by the 1870’s, but the waterfalls in and around Niagara Falls blocked any passage to Lake Ontario and the Atlantic Ocean. Plans to transform the St. Lawrence River into a deepwater link between the Atlantic Ocean and the Great Lakes began with a joint commission between the United States and Canada to study the possibility in 1895. Another commission was formed in 1909. Both faced immense opposition from leaders in western New York who feared the destruction of Buffalo’s industrial base. The discovery of large iron-ore fields in Labrador, Canada, which piqued the interest in steel mills in Buffalo and other cities. The Seaway would be the most cost effective route to transport the iron ore to those mills. Presidential candidate Dwight Eisenhower, who pledged a pro-business administration, voiced support for the Seaway. Canada, who, after years of delays in completing the Welland Canal, hinted that it might complete the Seaway on its own terms. Buffalo had not been prepared after the St. Lawrence Seaway opened in 1959. There were no deepwater ports for the new massive ships that barreled down the new seaway and many opted to bypass the city to unload goods at ports closer to the Midwest. The Port of Buffalo, which had handled 24 million tons of cargo in 1957, dropped to 16 million tons by mid-1960’s and just 9 million by the 1970’s. Bethlehem Steel’s decision to close its steel mill in Buffalo in 1982 all but eliminated the Port’s traffic. With the Seaway all but bypassing Buffalo, companies like Cargill abandoned their western New York operations except for winter storage when the Seaway was closed. But because of a reduction in the usage of railroads, those same companies began to lose their preferential railroad rates to eastern cities which then made winter storage too costly in Buffalo. It was no longer beneficial for companies to trade shorter delivery times to eastern ports for increased costs. Companies opted instead to rent entire trains and rights-of-way from railroads, giving them the ability to transport grain directly from the Midwest to the eastern ports without stopping in Buffalo. The Cargill Superior Elevator is one of those that have been ruined by the advent of the Seaway. The first phase of the elevator was completed in 1915, followed by additions in 1923 and 1925. With a capacity of 3.7 million bushels, it was one of the largest in the nation when it was built-out. The company that initially built the elevator, Superior Elevator, became more interested in establishing paper companies and overextending itself with debt, mirroring that of other corporations that ultimately led to the collapse of the stock market and the beginning of the Great Depression. 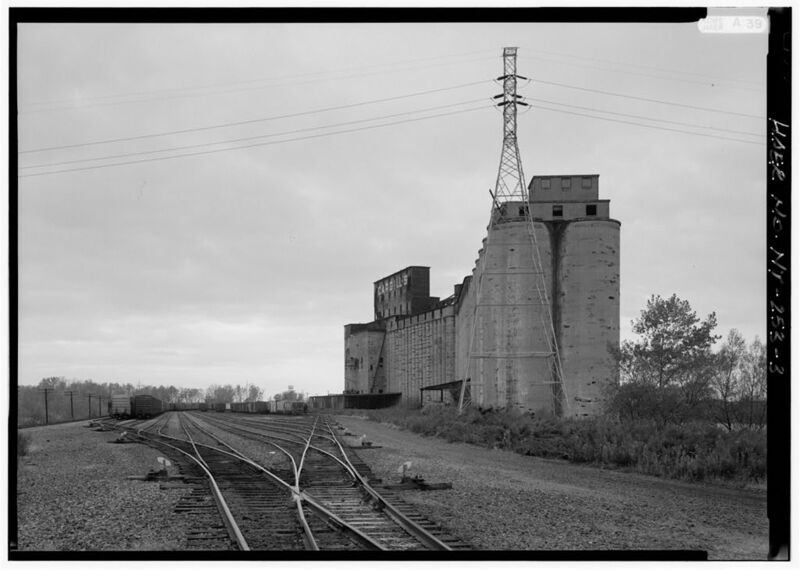 Cargill eventually took control of Superior Elevator, using the facility until the late 1960’s. The company opted to rent entire trains and rights-of-way from railroads, transporting grain directly from the Midwest to New York City without having to stop at its silos in Buffalo. 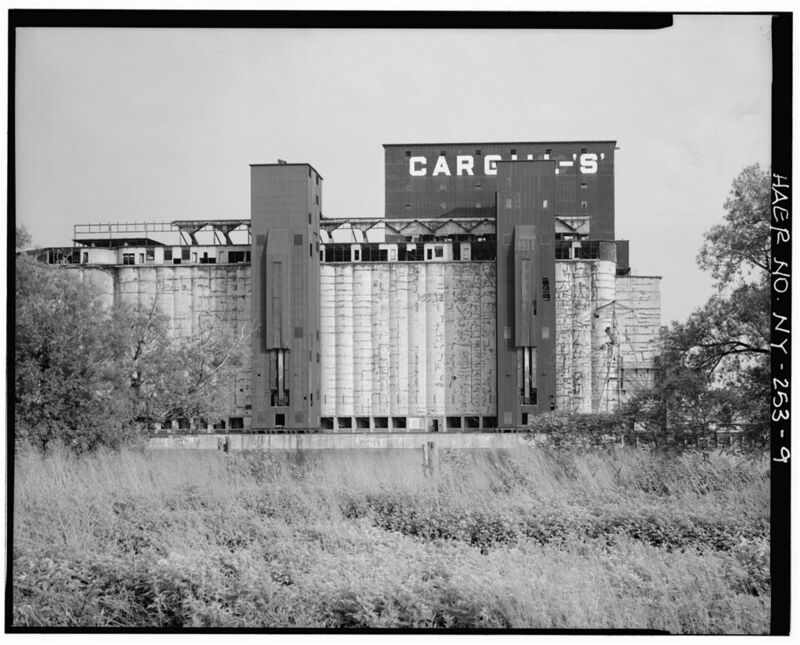 Cargill was unable to sell the moribund elevator by the 1970’s and eventually refused to pay taxes on the deteriorating facility. Other abandonments abound. Electric Elevator, visible from the Ohio Street Lift Bridge, was built by the Electric Elevator Company. The original Electric Elevator, constructed in 1897, was one of the first elevators to use electricity as a power source. It consisted of 19 freestanding cylindrical steel binds that could hold two million bushels of grain. 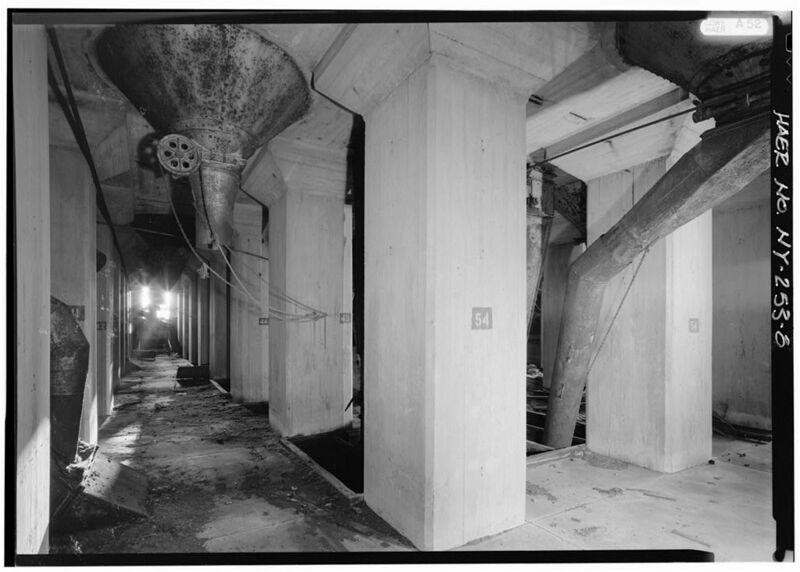 Cargill Corporation acquired the elevator from the Great Eastern Corporation in 1938 and in 1940, added a six million bushel concrete elevator annex. The elevator was used until 1968 when it was closed. The original steel bins were demolished in 1984 while the rest remained idled. 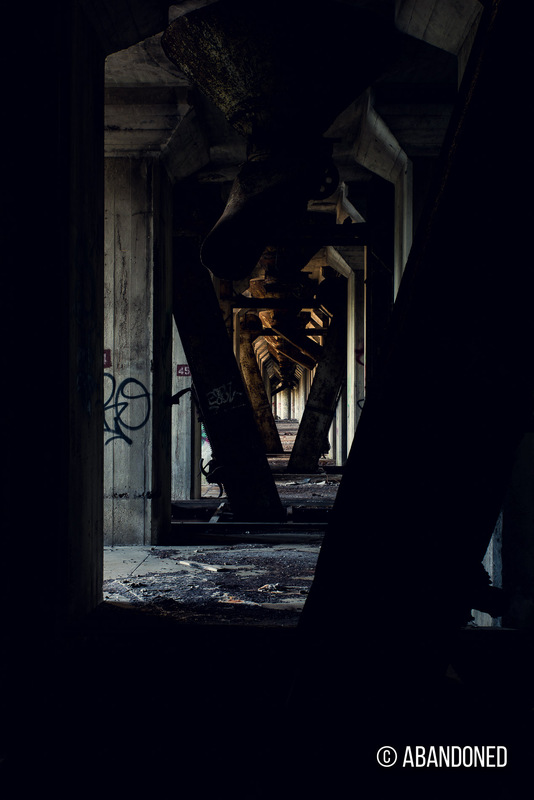 A portion of the complex was used to manufacture animal feed from old bakery goods, but was forced to close by the city in April 2000 after it was discovered that the rat-infested facility was operating without a permit for years. Visible at right is the Electric Elevator, American Elevator and Perot Malting Elevator. To the left is Standard Elevator. 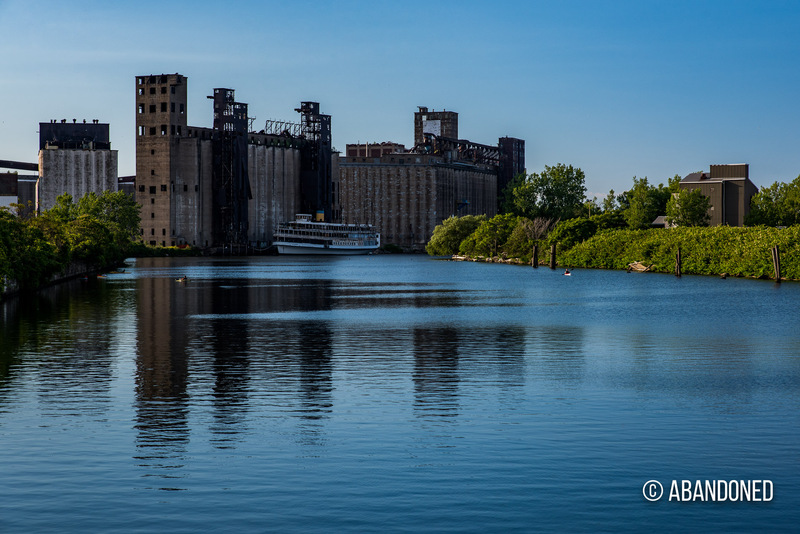 Behind it is the American Elevator, the first reinforced concrete grain elevator built on Buffalo’s waterfront. Designed and built by the James Stewart Company for the American Malting Company in 1906, it was used to support malt production for beer until 1921. It was then purchased by the Russell-Miller Company and used to supply wheat for their new flour mill. An addition was constructed by Harry Wait in 1933. The Peavey Corporation purchased the elevator and mill in 1954, operating it until 1982 when it was acquired by ConAgra. Adjacent to it was the Perot Malting Elevator, constructed by the Perot Company in 1907. The original 300,000 bushel elevator and malt house was constructed by the James Stewart Company, which was followed up with another 300,000 bushel elevator built by the Monarch Engineering Company in 1933. Between 1907 and 1922, the malt house received all of its barley via the railroad. An agreement was struck between the American Elevator and Perot in 1922 that allowed American to handle its water-borne shipments for Perot via an overhead conveyor system. 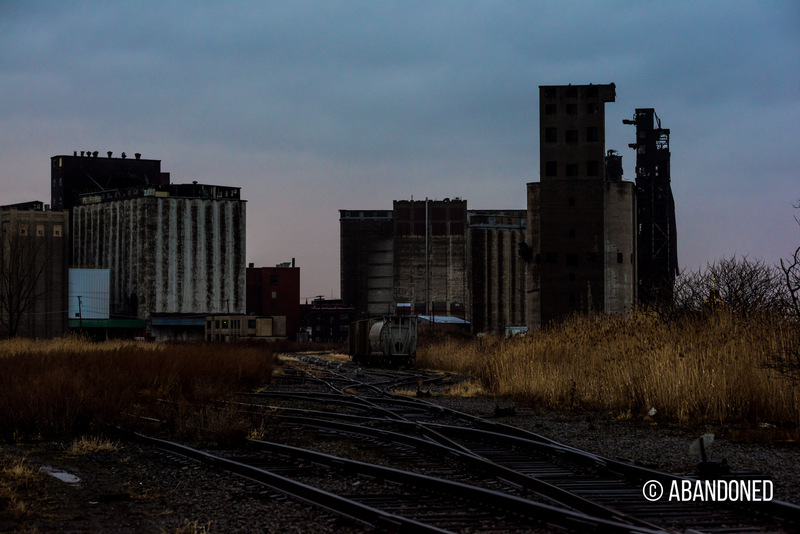 Perot Malting continued as Buffalo’s largest malt house until 1962 when it was sold. 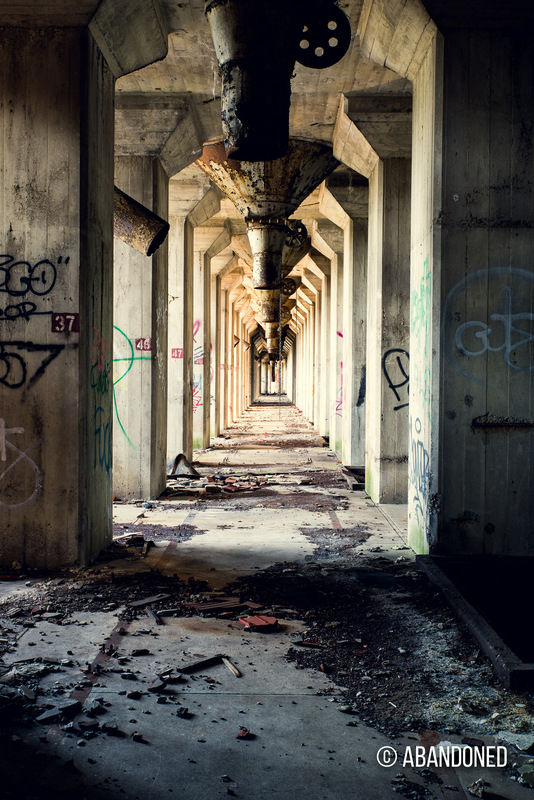 Although the complex is closed, it is maintained for potential reuse. A view of Lake and Rail Elevator at sunset. A view of the Marine Elevator at left and Lake and Rail Elevator at right. 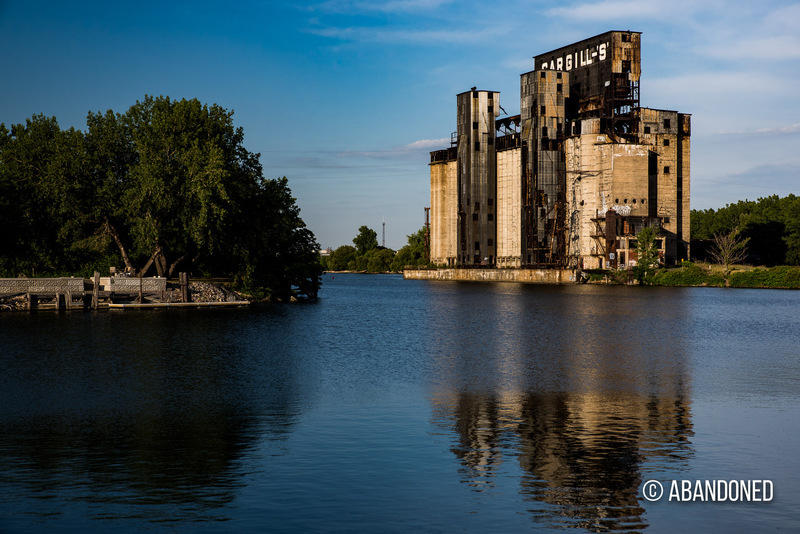 One of the few elevators that remain operational in Buffalo is the Lake and Rail Elevator that was developed by International Milling, which had established a new milling operation in Buffalo in 1926. In 1930, their new elevating complex, with a storage capacity of over four million bushels, had been completed. Designed and built by the Jones Hettelsater Company of Kansas City, the elevator was unique in that he had a 90-degree turn in the center of the complex, reflecting the sharp bend in the Buffalo River. International Milling produced several lines of grain products at the site, including “Robin Hood” milled flour. During World War II, the company converted surplus wheat into alcohol grits used in making synthetic rubber. The site was sold to ConAgra and Maple Leaf Milling in 1988 which operated the facility until 2005. In 2006, it was purchased by the RiverWright Corporation and renovated. Sold to Whitebox Commodities in 2008, the elevator has received incremental improvements designed to keep the facility modern and active. Adjacent to Lake and Rail is the derelict Marine Elevator. Constructed in 1925, it was the third Marine elevator built by the Abell family of Buffalo. Designed by the James Stewart Company, with A.E. Baxter acting as supervising engineer, the elevator had a capacity of over two million bushels. 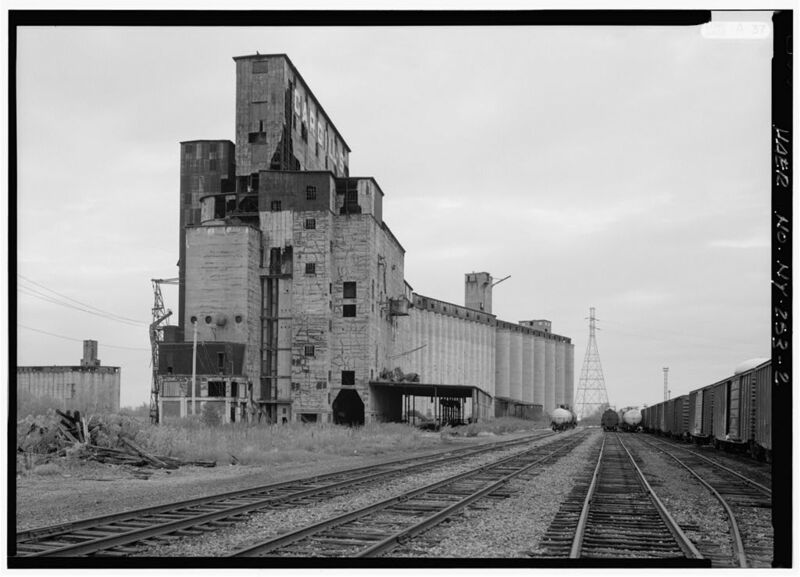 In 1954, the elevator was acquired by the Norris Grain Company who operated it until 1962. Finally, the Saskatchewan Pool Elevator, built in 1925 by the Monarch Engineering Company for the Canadian Farmers Cooperative, is the only grain elevator located on Buffalo’s Outer Harbor. Designed by C.D. Howe, it was well served by deep-water vessels and the Lehigh Valley Railroad. 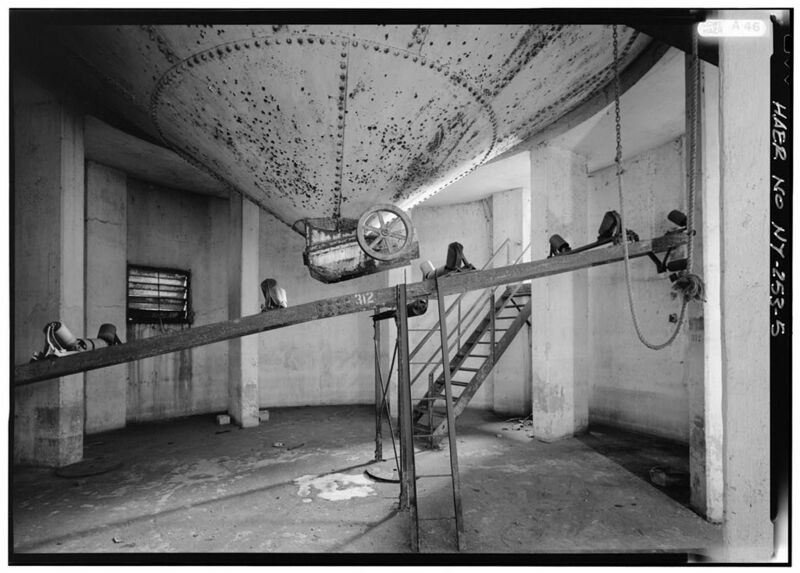 Pillsbury Mills purchased the elevator in 1952, operating it for a decade when it was mothballed. 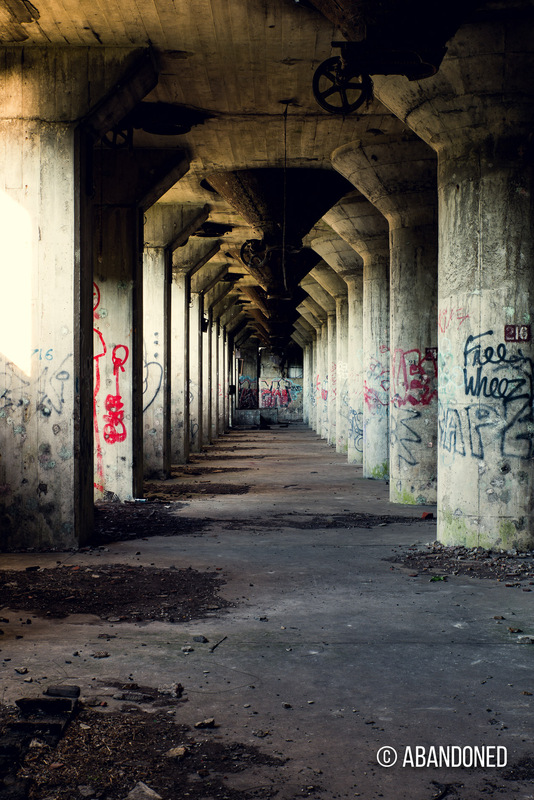 It was then acquired by the Cargill Corporation in 1964 who planned on using it as a winter grain storage facility. Those plans never materialized and it was then abandoned. 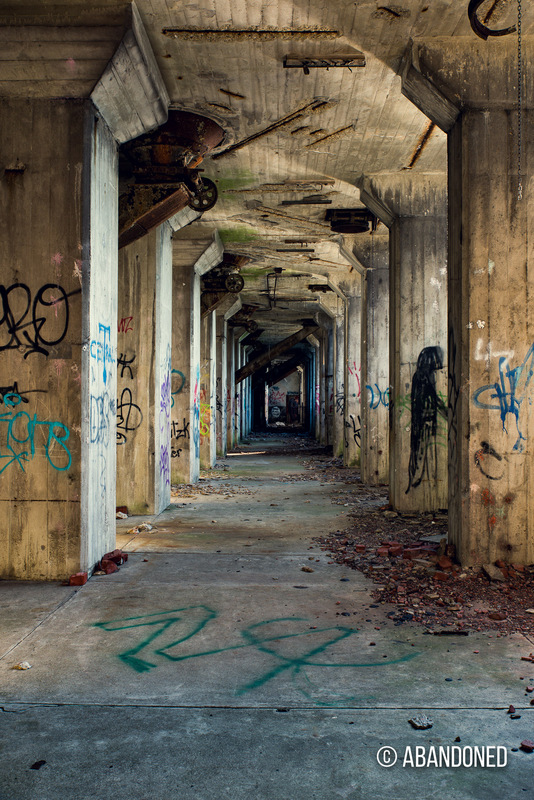 The elevator later served as a winter boat storage facility on the ground floor but that too has been shuttered.